The coldest months of the year are now behind us (although a few chill spells may come and go). That means, at Arabia and Panola Mountains, flowers are blooming and the stony mountainsides are being filled with life. Now is the perfect time to see the stunning plant life that defines these stony outcrops in the spring. 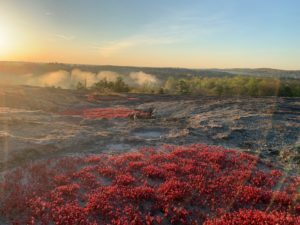 “Once a year on the mountain there’s a crazy botanical explosion,” says Ranger Robby Astrove of the Davidson-Arabia Mountain Nature Preserve. “There’s a lot of diversity, but dominating the landscape is the diamorpha,” Robby says. Also called elf orpine, this small plant appears as a vibrant red covering patches of the mountain during winter and spring. Over the past few weeks, the diamorpha has begun to flower, growing delicate white blooms. The blooms do not last long – they will soon begin to fade as the diamorpha prepare for the hot summer months. Diamorpha are dormant in the summer due to the extreme heat of the bare rock face. During the warmer parts of the year, these hardy plants look like little more than brown twigs sticking up out of patches of soil on the monadnock. This stage of the diamorphas’ life cycle is critical: during the summer, they hold their seeds above the ground, conserving energy until the fall (seeds that fall to the ground in summer burn and die in the hot sun). Then, in the autumn, the seeds drop to the ground and begin to germinate. The process starts again around December. Now, in April, this complicated life story is at its most vibrant stage. 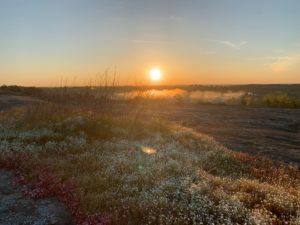 In general, Arabia Mountain and Panola Mountain are filled with blooming plant life at this time of year. The already lunar-like landscape becomes downright alien: “You kind of feel like you’re on another planet,” Robby says. Plants such as sandwort, the atamasco lily, the extremely rare granite stonecrop, rabbit ears and many others are growing and blooming across the mountains. Some of these species – like the granite stonecrop – can only be seen at Panola Mountain, a National Natural Landmark and Georgia’s first conservation park. Unlike Arabia, Panola was never quarried, allowing the granite outcrop ecosystem to thrive undisturbed. The springtime explosion isn’t restricted to the granite outcrops alone – everything seems to be blooming at once now. 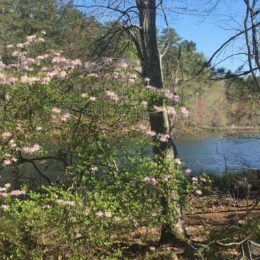 That includes plants in the forest: “The other thing that’s happening right now that’s totally deserving of a shout-out is our native azaleas are blooming. This is right on the forest trail,” Robby tells us. Especially along Arabia Lake, these native shrubs are currently revealing their springtime glory. 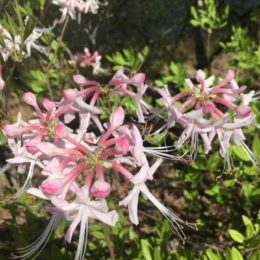 There are at least 12 native azalea species in Georgia (the azalea is also the state wildflower). Found in forest understory, you’ll have to step off the bare monadnock and into the woods to see these springtime beauties. The springtime bloom is beautiful. But it doesn’t last long: “We are approaching the peak bloom between now and the weekend – it’s happening,” Robby warns. That means that this weekend is the perfect time to get that last taste of monadnock spring before the summer heat starts to set in.